Geometric integrators form a particular class of numerical schemes for evolutionary equations that are especially constructed in order to preserve the geometric properties of the equation they discretize such as energy conservation, and conservation laws associated to symmetries. Such properties are of primordial importance for the applications we are focusing on, and rely on fundamental mathematical structures from symplectic and Poisson geometry. Whereas our applications are on the two different topics atmospheric/oceanic circulations and nonlinear continuum mechanics, the mathematical approach we will use to derive the numerical scheme is common in both situations. Namely, we use the geometric variational principles of continuum mechanics underlying the dynamics for both cases. This provides us with a unique point of view that allows transfer of ideas and technologies from one area to the other. This fact also illustrates the versatility of geometric integration schemes. · In the case of ordinary differential equations (ODEs), geometric integrators have been developed and exploited in various directions and form today a well established tool in designing numerical schemes in various area of applications in dynamical systems and engineering. Among them we find the well-known variational and symplectic numerical integrators for Hamiltonian systems. · For partial differential equations (PDEs), the situation is much more involved and there is still no well established development that fully parallels the case of ODEs. 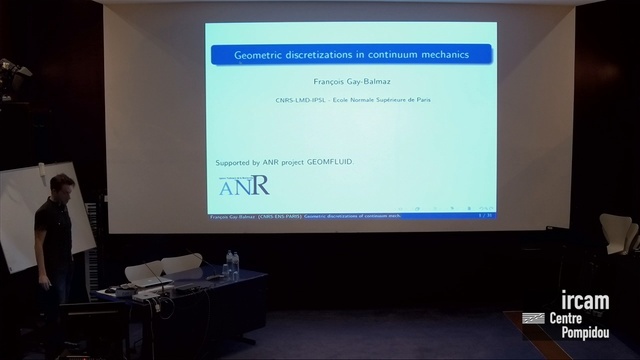 It is the goal of our project to start a systematic construction, implementation, and validation of geometric numerical integrators for certain class of Hamiltonian PDEs used in dynamical cores of weather and climate prediction models, and in contact and friction problems in continuum mechanics. As it will be highlighted, these are two areas where the specific properties of geometric integrators are of crucial importance.